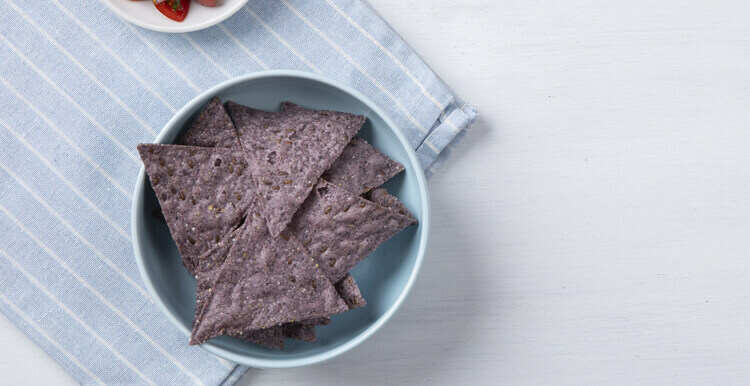 You won't be feeling blue with these satisfyingly crunchy sea-salted blue corn tortilla chips. Inspired by southwest flavors, these chips are the perfect on-the-go snack wherever you are. Ingredients: BLUE CORN, VEGETABLE OIL (SUNFLOWER, SAFFLOWER, AND/OR CANOLA), FLAXSEED, SEA SALT. Nutrients: BLUE CORN, VEGETABLE OIL (SUNFLOWER, SAFFLOWER, AND/OR CANOLA), FLAXSEED, SEA SALT.